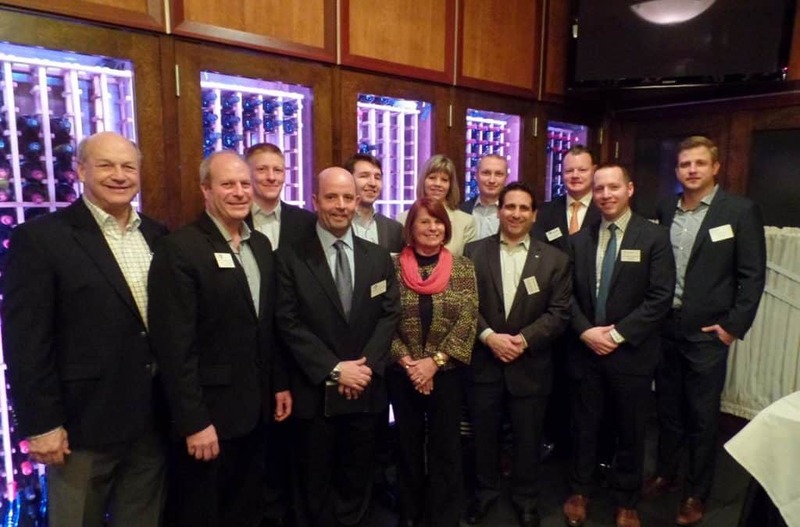 (Chicago, IL) – The Chicago Chapter of the Society of Industrial and Office RealtorsÆ recently presented the 14th Annual Chapter Awards in a presentation held at Gibsons Bar & Steakhouse in Rosemont, Illinois on March 22, 2016. The program is designed to honor the organization’s prestigious Platinum Sponsors and SIOR members who completed transactions within the Chicago Chapter or with a Platinum Sponsor. The Chicago Chapter completed 119 cooperative transactions from 49 members and 12 Platinum Sponsors totaling $652,218,311 in consideration and comprising 20,875,155 square feet as well as 125 acres of land. The awards were created by Joyce Slone, SIOR of Slone Commercial LLC (who has chaired the committee each year) to recognize those SIOR’s and sponsors for their outstanding achievement throughout the year as well as commend those that are committed to helping other SIOR’s reach their goals. The following are the individual awards for achievement in 2015. • Largest Dollar Volume Industrial Build-to-Suit for lease with two Platinum Sponsors – Jason West, SIOR and Sean Henrick, SIOR of Cushman & Wakefield and Denise Weinmann, SIOR of RGV Commercial represented Platinum Sponsor Venture One who was the developer and Platinum Sponsor Clayco who was the contractor for the 978,120 square foot lease valued at $45,410,998 for the tenant, 3M. • Largest Dollar Volume Transaction, Redevelopment with a Platinum Sponsor – Larry Much, SIOR of NAI Hiffman represented Platinum Sponsor DCT Industrial for a long term lease of an undisclosed tenant consisting of 189,987 square feet. DCT has purchased the building for redevelopment. Since signing the lease, DCT is leveling the building and had to purchase additional land contiguous to the site. Land and building purchases were a total of $65,000,000 in order to build the new building for the tenant. The lease value is not included in this transaction. • Largest Dollar Volume Transaction, Redevelopment with Two Platinum Sponsors – Platinum Sponsor, Venture One, brought a 277,562 square foot building at 2801 S. Western in Chicago; Platinum Sponsor, Keeley Construction redeveloped the building. Sally Macoicz, SIOR and Larry Goldwasser, SIOR of Cushman & Wakefield represented the redeveloped building for lease and the sale to Heitman for $30,280,000. • Most Transactions Completed by a Platinum Sponsor with Chicago SIOR members – Prologis with 40 transactions, totaling $165,527,496 with 25 members. The Society of Industrial and Office Realtors® is the leading professional commercial and industrial real estate association. With just under 3,100 members in more than 630 cities in 34 countries, the Society represents today’s most knowledgeable, experienced and successful commercial real estate brokerage specialists. To learn more about the Society, contact www.sior.com or the Chicago Chapter at www.siorchicago.com.